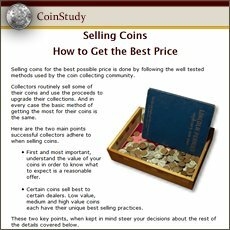 Accurate value of any coin relies on determining its condition. Grading Roosevelt dimes judges specific areas of the coin for the presence of wear. Depending on the amount of remaining detail a "grade" is accurately assigned. 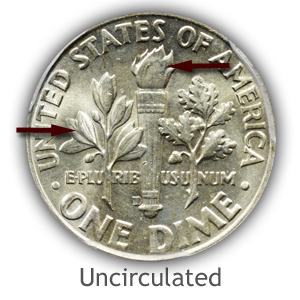 Follow the video as examples of Mint State (Uncirculated) condition to Good condition dimes are described and graded. 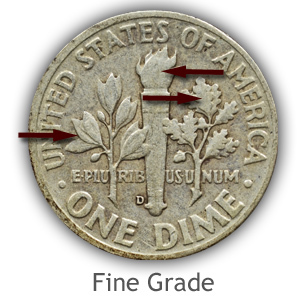 With a little time and study the skills to accurately grade old dimes develop. Your eyes become keen at detecting the finer details. Additional images and descriptions highlighting the different grades of Roosevelt dimes continue below. First to consider is the sought after "Uncirculated" Mint State condition. What separates this coin from the rest is the surface is absent of any wear. Original mint luster… what gives the shine of a new coin… is delicate and quick to fade as a coin is used and circulated. Rotate the coin while holding under a light and unbroken luster moves across all elements; from high points to the flat areas of the fields. 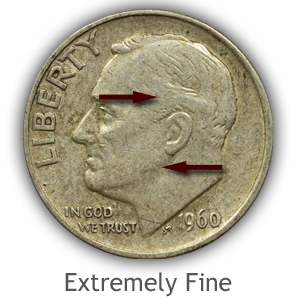 As small amounts of wear begin to show to the surface the coin it is now considered "Extremely Fine" in grade. Although wear is visible; it is not distractive and overwhelm the overall appearance. Although some reduction in detail is evident on the torch; all vertical lines remain separated indicating this coin is a full Extremely Fine grade. Grading Roosevelt dimes in fine condition. Evident on this coin; time in circulation and wear has removed moderate amounts of detail. However in appearance, the coin presents itself as nice and well detailed. 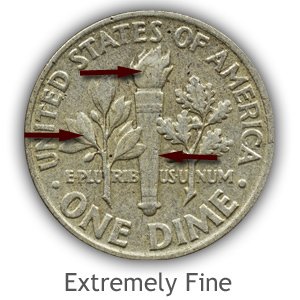 A Roosevelt dime in the good grade has lost most of the fine detail. Overall appearance of these coins is some facial contours, wide areas of flatness of the hair, faint lettering and low profile rims. Using magnification to enlarge your view of coins speeds up the grading process as well your learning curve to accurate judgement. If only a few coins are involved an image taken by your phone and zooming in is a quick solution. A 5x magnifying glass is handy for larger groups of coins. Subtle points to grading described above are not only specific to the Roosevelt series but somewhat universal to grading of any series. Identify fine details to designs; recognize the amount of wear and judge their severity is the basic approach to grading coins. 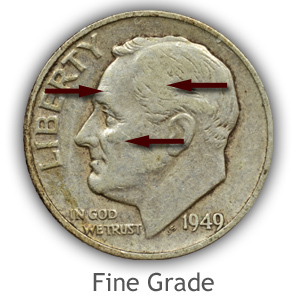 The value difference of Roosevelt dimes from the various circulated grades and the sought after mint state grade requires a close-up judgement of the coin's condition. If a conservative approach is used as you grade, others will likely agree, locking in an accurate value. Primary is the confident separation of the lowest valued bullion grade dime from a collectable grade Roosevelt dime. Bullion condition silver dimes are worth $1.13 as of 4/22/2019 . In the top end condition; all mint state examples are given a premium value above silver bullion value. 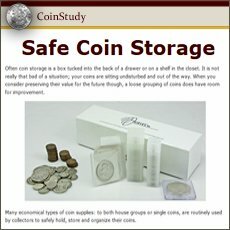 How to recognizing these coins is covered in the video, close up images and descriptions. The deciding factor is no wear to the surface. Among the circulated grades of Roosevelt dimes; very few dates and mints are currently worth more than silver value. In extremely fine condition the 1949 | 1949-S | 1950-S | 1951-S are valued as a collectable. Beginning to make a move into this group is the 1950. A future value play is to separate any of these in solid XF condition from the bullion group. 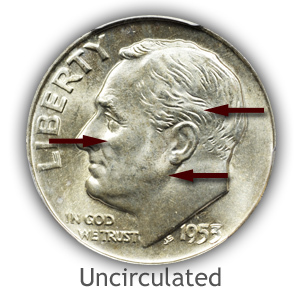 Look especially for coins with a "crisp" defined appearance with all vertical and horizontal lines of the torch sharp. A strong interest in dime collecting is reflected in the number of registry sets currently listed. Each of the two major grading services; PCGS and NGC host Registry set communities; collectors showcase their collections of Roosevelt dimes and are recognized for the best collections. Various major categories of Roosevelt dimes are listed with thousands participating. 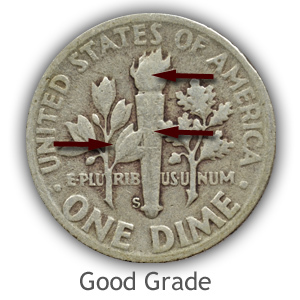 At the low end of the grading scale; a Roosevelt dime worn to the state of "Good" condition is considered a bullion piece. These are separated from collectable coins and trade at their silver value with little attention to date and mintmark. It is an important grade to recognize and value according. 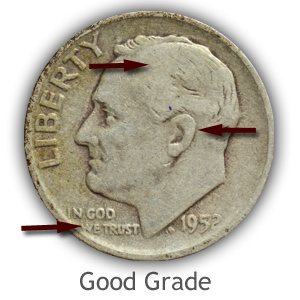 Put to use the grading skills to evaluate Roosevelt dime condition. Values by date and grade listed.